The brand name for Samsung’s Cinema LED direct view screen will be Samsung Premier. The trademark application was discovered and shared with Celluloid Junkie by consumer electronics website LetsGoDigital, which found that the Korean electronics major filed a trademark application (serial no. 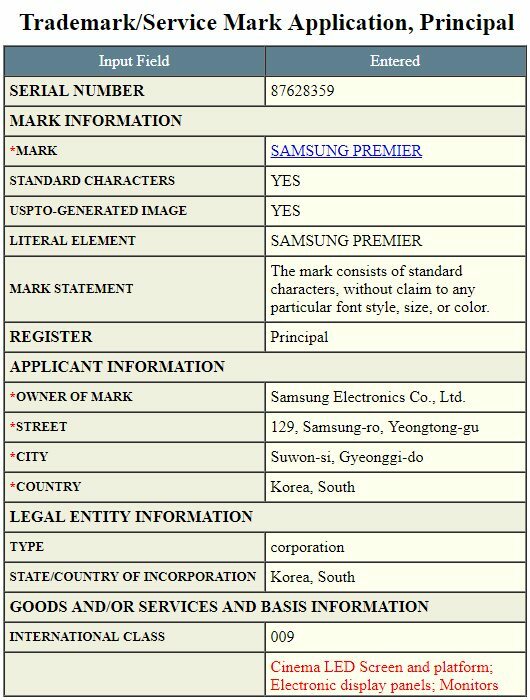 87628359) for the name Samsung Premier with the USPTO and the EUIPO on 29 September (see chart below). Interestingly the application indicates that Samsung Premier is not restricted just to cinemas but that it sees a potential for the DV screens to also be installed in performance venues and homes. Samsung could thus have an ambition for Premier to also be a very high-end home cinema option for first-run feature films. Samsung has been moving rapidly with its disruptive cinema technology, having unveiled its DV technology at CinemaCon 2017 in March of this year, with DCI compliance achieved in May and the first unit installed in Lotte Tower on 13 July. Samsung has stated an aggressive target of achieving 10% of total global cinema screens by 2020, by which time it estimates that this would equal 20,000 out of a total of 200,000 screens. There are strong indications that the second Samsung Premier screen installed will also be with Lotte in the South Korean city of Busan, most likely in time for the Busan International Film Festival, which runs 12-21 October and is one of Asia’s leading film festivals and gatherings. Samsung may have been hoping to announce the new name at the festival. The next screens after that are likely to be installed in Los Angeles (Burbank) and two in Europe (one in London and another in a Scandinavian capital) according to sources that Celluloid Junkie has spoken to, who also revealed the names of the two likely European cinema operators involved. The news comes at the same time as the strongest indication yet that Sony is going ahead with the commercialisation of its rival video wall LED technology for cinema, which has been used in non-cinema installation under the CLEDIS brand. Speaking at this year’s IBC show, Sony’s Oliver Pasch pointed out that the technology was “almost too good for cinema”, meaning that it was over-specd for cinema requirements. This might indicate that Sony is looking at engineering a simplified and lower-cost solution for cinemas, which would also be DCI compliant in terms of security. Sony demonstrated the technology at the recent convention of French cinema owners in Deauville, where it was positively received. In order to be installed in French cinemas, as well as DCI approval, the technology would need to be cleared by French audio-visual regulators CNC and CST. However, Sony has yet to start shipping its laser projector technology (delivery is set for this winter), so promoting its DV cinema LED technology could create market confusion and under-cut its laser projectors. Cinema installation companies in Europe are saying that they are getting requests from exhibitor customers to see if they are able extend the lifespan of their first and second generation digital cinema technology for another 18-24 months, in the hope of going straight from Xenon-based lamp projectors to DV screens, without having to install laser-light illuminated projectors as an intermediary step. While Samsung Premier screens are believed to be costly, even if the 100,000 hour life span promised offers savings over time, cinema operators believe that Samsung will have to slash its prices aggressively to achieve 10% global market share by 2020. The only time Samsung has previously used the name ‘Premier’ was in connection with its 2012 Android smartphone, the Samsung Galaxy Premier I9260.